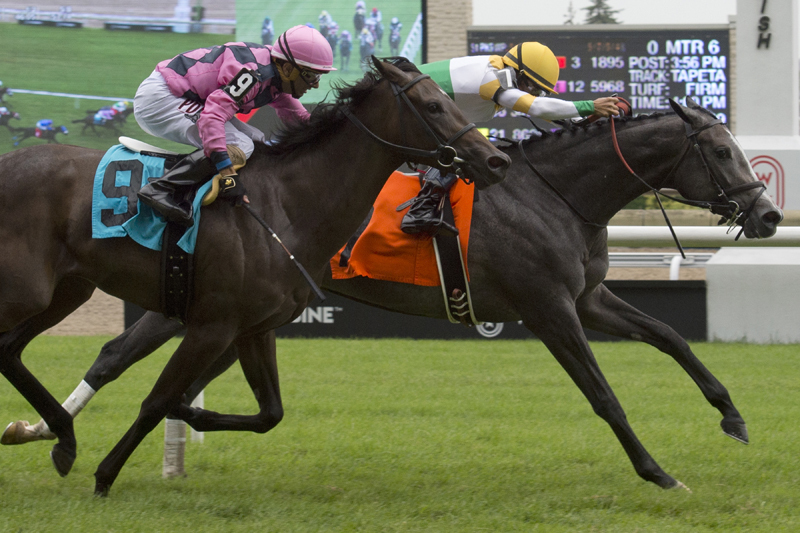 Bold Script and Avie’s Flatter, both exiting Grade 1 one-mile turf stakes at Woodbine, will be in with fellow Canadian-bred two-year-olds in Sunday’s $225,000 Cup and Saucer Stakes. The Cup and Saucer, a 1 1/16-mile race on the E.P. Taylor Turf Course, attracted a field of 10. Bold Script comes into the Cup and Saucer off a solid third-place finish in the September 16 Natalma and the top two there, La Pelosa and My Gal Betty, are aiming for the Grade 1 Breeders’ Cup Juvenile Fillies Turf at Churchill Downs. Bold Script was making her third start in the Natalma after being a game winner when travelling six furlongs and then finishing third in the Catch A Glimpse Stakes over about six furlongs of yielding turf. “In her second race, she kind of got a raw deal—she was stuck in the one-hole,” said Simon. Gary Boulanger will ride Bold Script for the first time. Avie’s Flatter overcame an awkward start when winning his five-furlong debut and ended a troubled fourth when making just his second appearance in the Summer Stakes on the September 16 program. “He got very tired,” said Josie Carrroll, who conditions the homebred Flatter colt for Ivan Dalos. “He got a lot out of the race. I was happy to get a good mile into him before the Cup and Saucer. He ran a real credible race. Leading rider Eurico Rosa da Silva again will do the honours. The final clocking for the one-mile Natalma was 1:33.70 with the Summer going in 1:33.90 off slower fractions two races later. Fillies have fared well in the Cup and Saucer in recent years with Hard Not to Like capturing the 2011 edition and Dixie Moon prevailing last fall. Carroll will field a second Cup and Saucer contender in Ojiisan, who was an impressive winner for owners Stephen Crooks, Mario Serrani, and Glenn Sikura over six furlongs of Tapeta in his lone start to date. “He breezed exceptionally well on the turf,” said Carroll, who had watched the Stormy Atlantic colt clock five furlongs in 1:00.60 on a “good” turf training track here September 29. Luis Contreras will be back aboard the homebred. Kitten’s Girl, successful in her lone outing over seven furlongs of turf under jockey Patrick Husbands, also merits respect in his stakes debut. Like Bold Script, Kitten’s Girl also was nominated to Saturday’s Mazarine Stakes, a 1 1/16-mile race for two-year-old fillies on the main track but is opting to face males in the Cup and Saucer. Kitten’s Girl was no secret in her debut, powering to a going-away 3 ½ length victory as the odds-on choice. “She did her best running late; she came home really fast,” said Pierce, who is confident that the longer distance of the Cup and Saucer will be no obstacle. Rounding out the field will be Moon Swings and Tricky Magician, who finished sixth and seventh, respectively in the Summer Stakes last time out; Just Like Larry, a maiden after two promising turf starts; Groundhog Day and Hesathriller, exiting maiden claiming victories; and first-time starter Flying Curlin.